There were many times in the mid-Sixties when a thoroughly respectable motorist craved an escape from endless press reports of Carnaby Street and Swinging London, the World Cup, those incomprehensible ravings of the Beatles and chaps who dared to look like beatniks in public. What they really wanted was a small convertible to complement their off-duty blue blazer, and if it came with a kettle (and a 12-volt power point) in the boot, so much the better. 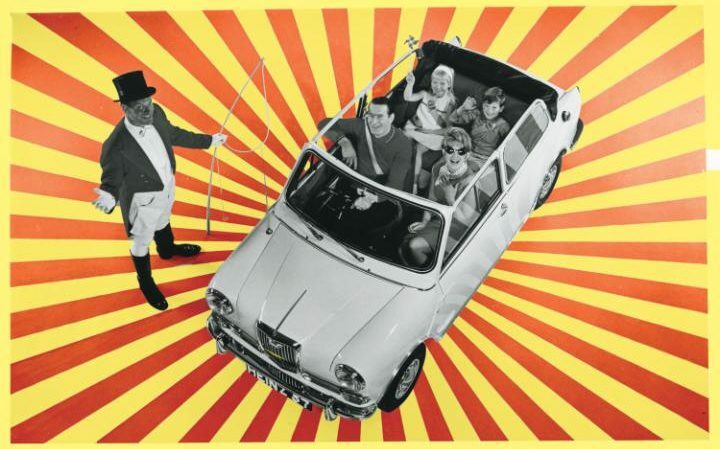 Enter the “Heinz 57” Wolseley Hornet Convertible, a car so exclusive that it could only be won via a soup-related competition. In 1965, famed baked bean and condiment manufacturer Heinz commissioned British coachbuilder Crayford to convert 57 (naturally) Hornets into dropheads as prizes for the competition. The firm was founded in 1961 by former Lambretta employees David McMullan and Jeffrey Smith, with a joint investment of £20. Two years later Crayford’s soft-top Mini Sprint was offered to motorists who wished for a car that was “as snug as the saloon when closed and a four-seater sports car when opened”. 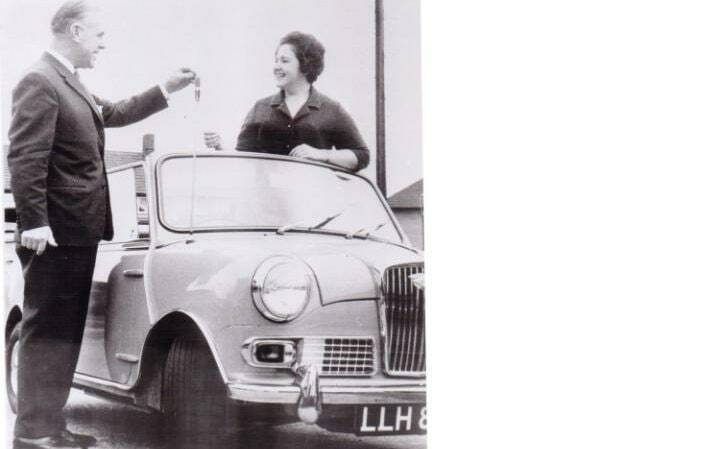 Crayford also offered a conversion for the Mini Cooper that claimed to allow drivers to ‘“see off” the sports cars and let in “the birds”, but this was evidently far too vulgar for Heinz customers, so the prizes would be based on the upmarket Wolseley Hornet version of BMC’s Mini. The Hornet’s extra length and vestigial tail-fins also made it arguably more aesthetically pleasing than the Mini Sprint drop-top. Crayford removed much of the body and welded steel strips along the door sills and across the rear of the car to compensate for the loss of rigidity after removing the roof. Those 57 cars represented a very large order for a very small firm, so Crayford was obliged to seek alternative storage facilities; according to the owners’ club, the rather Carry On-style solution was to keep the Wolseleys at the Tatesfield nudist colony over the winter of 1965. By early 1966 Heinz was advertising “The Greatest Glow On Earth”, with a chance to win a car whose features included the aforementioned kettle and electrical socket, a push-button radio, seat belts fore and aft, a Brexton picnic hamper complete with a vacuum flask (for your choice of cream of tomato or possibly clear chicken broth), a tartan rug, two insulated food cabinets and, for “the little lady”, an integral make-up tray containing the finest of Max Factor’s cosmetics. The colour choices were white or birch grey, both selected to complement the red leather upholstery, and you could even have your own personal monogram on the driver’s door. To stand a chance of winning one of these splendid vehicles, all you had to do was place eight kinds of soup in order of preference and complete the statement “I like to take Heinz Soup on a picnic because…” and enclose the appropriate labels in an envelope. The company received more than a million entries, presumably because the chance to make the neighbours envious was evidently worth any amount of oxtail consumption. Of all versions of the Mini, the Heinz 57 Wolseley Hornet is possibly the closest to the Sixties of Ladybird books and whist drives rather than The Avengers. You can imagine the original winners listening to Mrs Dale’s Diary on the BBC Home Service rather than trying to receive Radio Caroline on the Wolseley’s transistor radio – and draining the battery in the quest for a nice cup of tea.